Last week, #appsworld 2013 was held in San Francisco... and FutureMakers was lucky to be there ! Mobile is not "tomorrow because we have to review our online strategies first", Mobile is "TODAY because consumers are extremely active on mobile touchscreens". The presentation below is therefore an introductory guide to mobile for hoteliers. A mini case-study with a real brand called So Jennie - this presentation aims at showing that with optimized text and website page, the ranking in Google results can be higher than ever ;-) and the Valentine Day page is at the heart of this mini-study. I tested Phrase it... and it's quite cool!! I hope you had a beautiful week! If you are looking for something fun to do this weekend (well, if you're staying at home and have nothing scheduled yet! ), let's try Phrase it! A fun and easy-to-use platform, which enables you to create funny bubbly images within seconds! If you already tried it before, what is your feeling about this platform? +Disney announced a series of new technological tools that were created in order to facilitate the visitor's visit to the theme parks, but also sparked a discussion about a possible invasion of the privacy of tourists. Last month, in the official blog of the parks, the president of the complex, Tom Staggs, described some features that are already being tested for a few months and which, he says, will be available this year for visitors. 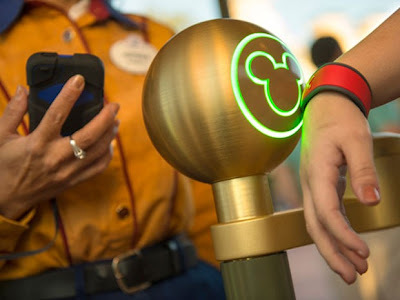 One of the main tools is a bracelet called MagicBand, equipped with radio frequency identification technology, which will serve as admission to the theme parks, hotels room key and to schedule visiting hours for the attractions and restaurants. It may also contain the visitor's credit card information which will enable the payment of any costs in the complex without the need to take out the wallet. However, the launch brought up concerns about the privacy and security of guests, as they could have their behavior monitored in every detail: what they bought, what attractions walked in, how long they waited in line, even which characters they shook hands with. As everybody knows, this information can be used, for example, in highly personalized marketing campaigns. Some future visitors exposed their questions in the comments on the blog. As many support and ask (or even beg) to be part of the team testing the new feature, some still have concerns, and they come in all kinds: "Can I have a private address to discuss this new tool? " or "Can you elaborate on what data is collected and how it is used? The visitor can choose not to have your personal information used in marketing future?" or even "Things on my wrist are annoying after a few hours" complains a user. "I'm not so worried about privacy, but I doubt I would want to attach a credit card to my band," said another user, putting in doubt the safety of the system. Staggs responded to questions on the blog itself. He said that ensuring the security of information is "obviously very important" to the company. "Nobody is more focused on that than ourselves. All of these features are optional, and visitors can choose what information they want to share with us. " According to him, the personal data of every visitor will not be stored in MagicBand. Aside from the band, the new experience that Disney wants to create, is called MyMagic+ and includes a website and a smartphone app called "My Disney Experience". They will bring real-time information about what is happening on the parks and it would allow the change of any previously made schedule. "The project is for both who like to plan every detail of the travel in advance and for those who prefer to let the day run spontaneously," said Staggs on the blog. For him, the new set of tools will provide a completely new experience to visitors. Personally, I believe the MagicBand is good for both Disney and guests. Good for the company's database and good for the guests that can have their visits better planned. And if they want to use on their marketing plans that I went on the giant Teacup ride, bought Minnie ears and that I hugged Jack Sparrow? Good. Maybe next time we will have the pirate riding Space Mountain with us. And you? What do you think of the MagicBand? Among the main discussions at the E-Marketing Conference in Paris were a few tips which are worth to note for companies wishing to improve thier online strategies. Main themes focused on were consumer data and company digital strategy (with an emphasis on mobile). The presentation below relates 4 of the most interesting facts.